Your personal memories and use of computers? First introduction was in the late 1960's when I started with Montgomery Ward... one of the early retail users of computers in the form of an IBM 605 (I think) punchcard system and a large "white room" with huge tape reels and literally millions of punch cards, with a staff of 8 keypunch operators (Albany NY Catalog House). Screams of distress when someone dropped a large tray of cards after six or seven sorts. 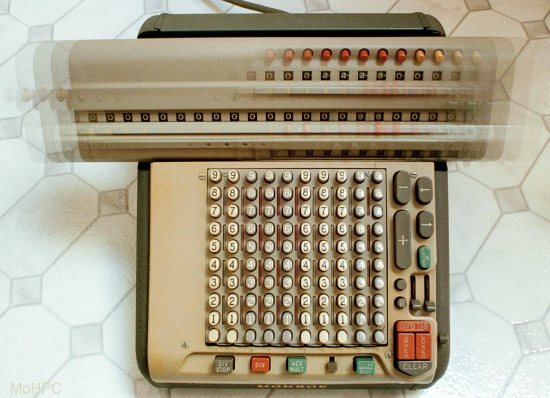 Until 1986, 2000+ retail units used keypunch to process orders. When I moved in as a manager in 1972, the first transition from manual comptometers was taking place in accounting. For the first year, there was only person who had one, a Commodore "nixie tube" monster, (about $1500 then). You had to be directly in front of the deep screen to read the numbers. One of my jobs was to build budgets for 250 stores... manually with a mechanical calculator... a two month project twice a year. http://www.vintagecalculators.com/as...SharpEL8_6.JPG which cut down the time to three weeks. That one cost $500 at discount prices. Equivalent of today's $1 calculator. The next actual computer was an ADAM... that Wards sold at Christmas in 1973, when the most common home computer was Pong... by Atari. I bought the ADAM for the family, which gave my young sons a head start on what was then a fast growing technology. I still have this computer (used a TV screen as monitor). In 1986 when I opened my own business, bought an Apple IIE... and a Gerber IV. a precursor of todays' 3D technology, and at the time, the cutting edge of signmaking. Since then, probably 20 different computers... most salvaged or given to me by neighbors when they upgrade. Fun to look back ... from the early days, when you had to learn "Basic" to do anything at all. The first 300 Baud modem... the first time on a bulletin board, and the beginning of AOL, when my Username was Bob5...to the first high speed connection to the server @Home in 1996... Wow!... Cable! Not much different since then. So, How far back do you go? Abacus? It turned out to be a very good skill to have when I was looking for my first job. Much later in my career, when I wanted to emphasize how long I'd been in the business, I'd refer to "the days when we chiseled our Fortran codes onto stone tablets". Yes, my first manual computer was an abacus , which I still have. My first electric computer was a VIC 20, which I still have. (BTW, the abacus was more useful than the VIC 20.) My first useful electronic computer was an AT&T 6300. Dual 360kb floppy drives, 640kb of memory, 8086 processor and a mono-chrome monitor. I remember paying $1950 plus tax for it back in the 1984/85 time frame. I went through several 286s, 386s, Pentiums, until what I have today. What really amazes me is the cost of storage. I can remember the first Hard Disk I bought cost over $200 for 20 megabytes. Now I can buy ~5 Terabytes for less than that. First hands on introduction was 9th grade in1984. A friend owed me $20.00 and asked me to meet him at the school computer lab to pick it up. I never left. I was addicted immediately. I was writing BASIC on those trash 80s the first day. Purchased an 8088 Tandy 1000 with 256 megs of memory. No hard drive. 5 1/4 360kb floppy. Still have it. Purchased a Commodore 64 and a Commodore Amiga 500. Amiga 500 had the first full color photos I had seen. It took like 30 seconds for the pic to draw. I remember saving for months to buy the first 3.5 disk drive. And drooling over color scanners and printers. Belonged to several BBSs and played some of the first online games. Text based games like Tradewars. Used the internet before the world wide web using Telenet and dial up. Seen the world wide web for the first time on Prodigy. A customer at the computer shop I worked a, Electronics Boutique, invited the store clerks over to his home to see it for the first time. It was so slow it was painful but amazing to see live images displayed for the first time. Remember AOL chatrooms? Maybe that's why I am not a big Facebook user. I feel I alraedy lived through that experience. I never had any formal training but was able to obtain work writing and designing webpages and software for a small school in 1996. Currently, I develop a few Windows desktop applications. Would love to write tablet apps but just dont have the time. Oh, that brings back the image of core memories , where each bit is encoded as the polarity of the magnetization of a little ferrite bead. We were still using it in the lab machines at my 1st megacorp, up till 1986 when I left. Later, read that the Space Shuttle flew with the same technology up till at least the mid 90s. 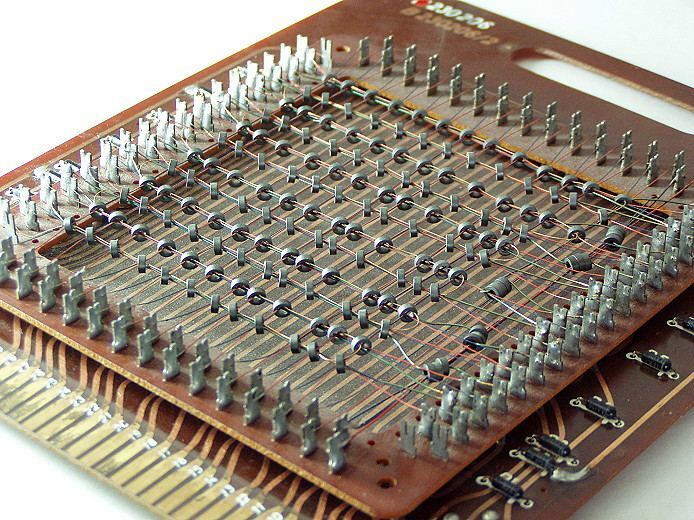 My first computer experience was coding in fortran with punch cards at junior college in 1973. Went to work in 1974 and used hp and ti calculators for a few years until we got a Wang computer. Then switched jobs in 1981 and used an HP85 for several years. Then on to HP and Dell PC's. Had an Apple IIe at home in the early 80's, moving to PC's and eventually back to macs around 2000. AN/FSQ-7, also known as the SAGE (Semi-Automatic Ground Environment) computer, used at about half a dozen locations around North America to control air defense. My first office was INSIDE one of them. So maybe you should think about changing your name from braumeister to TRON. The first computer I used was a Unix workstation where my father worked. That was around 1981. I fell in love with an ascii text based Star Wars game where you navigated the Enterprise around a galaxy of asterisks. I was 12. The next summer I delivered flyers door to door and saved up to buy a TRS-80 color computer with 16K of RAM, and I taught myself BASIC and wrote useless little games and scripts. Since then I can't keep track of all the computers and OSes I've used. The first computer I used was a Unix workstation where my father worked. That was around 1981. I fell in love with an ascii text based Star Wars game where you navigated the Enterprise around a galaxy of asterisks.. Trying not to geek out too much here but was it intentional to include the Enterprise and Star Wars in the same sentence? Programmed in FORTRAN on punch cards in college for an elective class. One of my first jobs was doing computer-aided design on a DEC PDP-11/70. Became the admin after teaching myself DCL and taking a couple more classes. System got upgraded to a VAX 11/780. Was admin through the transition from removable 300MB multiplatter disks to 9-track tapes to 8mm tapes, from a VAX 11/785 to UNIX workstations (more self-teaching). When we went to UNIX our CAD vendor wanted to start using email so I was one of the first 5 people in our 1000-employee company to have email. Even today, emails sent to <my first name>@<my company>.com still get delivered to me. New employees can't believe it. Then it became possible to do CAD on PCs and we decentralized much of the system to be handled by the IT group. On the personal side, my first computer was a second-hand Atari 800. Then moved in to the Intel world and bought a very pricey PC from a boutique operation in Michigan - it was the most modular PC you could get and I was positioning myself for future upgrades without having to scrap everything. But it turned out the technology advanced far faster than I imagined, and the only upgrade I ever made on that machine was adding a math co-processor before it became obsolete. I don't run systems any more, though. My earliest is the DEC PDP-8 with a whopping 2 K of memory. Later upgraded to a huge 4 K. Was in an 8' tall rack. with winky blinky lights showing tha computing process. On a research ship. Punch tape for data and program input. Teletype for data output in addition to punch tape. My first experience with computers was in high school in 1968, taking what they then called a "data processing" course. Lots of punch cards and hand-wired boards that we were supposed to rewire to perform different jobs with the cards. I had a very hard time understanding those. I don't think we had an actual computer there, if necessary the job (in the form of the punch cards) was taken elsewhere and run. I too remember screams of dismay at a dropped box of cards. I do remember going into a Radio Shack store when the TRS80 came out and inquired about it. I blanched at the price and left. I finally did buy a computer in 1991 when I was taking classes again, mostly for the word processing software (Lotus Ami Pro was what I used, I thought it much better than the WordPerfect everyone else was using). The PC itself had a 386 processor, 4 MB RAM, I paid extra for a 120 MB hard drive, and an option was a 120 baud modem. I was a little unsure what I'd actually do with that but I'd read of something called bulletin boards and wanted to see what that was about. The OS was DOS 5.0 and it came with Windows 3.0. DW agreed to this expensive for us ($1,600) purchase if we could also get Lotus 123, which she was trying very hard to get her head wrapped around in a new job. It wasn't a major brand and was built by a family operation that was nearby - I figured that if there were problems with it, it would be easier & faster to take it there than ship it somewhere. I got the thing home, figured out which cable went where (no manual with it, no color coding back then), and opened the DOS and Windows books and started reading. I remember thinking "This looks like magic. How does it really work?" That started me on a long book-buying binge to at least partially figure that out. It was also a dramatic career-changer. (I was working in the Fraud Section at the time doing white collar crimes investigations.) This started when I attended an in-service training class that included an hour presentation by an FBI agent, at the time the only one with a Ph.D. in Computer Science and he had to write his own software to recover deleted files. He talked about interleaved sectors and clusters on a hard drive and a somewhat famous case he worked on. To make a long story short a woman in PA died a horrible death because the police in a previous case had ignored a home computer as a possible source of evidence. (Remember this was the late 1980's, when a home computer was a rare thing to see.) I was the only other one in the room who had a clue as to what he was talking about and what bothered me was that I could see the same thing happening in our Department. I set out to change that, and did. SAGE--the big concrete cube. Amazing for its day, I remember visiting one of the cubes (at McGuire AFB) in the mid-1980s, it had been converted to office space. I took a programming class in college (1982), learned a language called "PL-C". We wrote our programs on IBM cards and the ran as batch jobs. It was clunky, but I did learn what it was about--and that de-bugging took about 4 times as long as writing the code in the first place. My first computer was a Commodore 128 in about 1987. It was actually pretty useful for writing papers, going online through dial-up, etc. I probably had $2000 (then-year dollars) in that setup, including a color dot-matrix printer. No hard disk, just a 5.5" floppy for storage. Pretty amazing what could be accomplished with just 128K of RAM--there were full-color GUI applications that included drag-and-drop functions, etc. Anyone remember Compuserve? I used a program that nearly everyone used (forget the name) to rapidly download the threads from any subscribed boards, you'd read them offline and then upload any responses in a separate dial-up session. The technology was slow, but the subscription fees and hassle of using the technology served as an informal barrier to entry that, I think, helped improve the quality of information in the various fora compared to the wide-open mnet that would follow. Not to be elitist, but if you took the time to get to a particular forum, there was a good chance you knew something or were truly interested in it. Later machines included the typical parade of 286, 386, etc boxes. I remember slavishly looking at all the ads in the very thick Computer Shopper magazine to find the best deal on just the package of hardware and software I wanted. Yes, remember CompuServe and subscribed to it for a while. There was a program that I used to dial up a local BBS run by a computer club that would gather all new posts, put them in a zip file, then open and display them. There were enough local BBS that there was no need to go long distance to reach one of interest. I did this because a major issue between me and DW at the time was when she got home from work about a half hour after I did, she would be on the phone for at least an hour with her mother, or sister, or an aunt, or some relative somewhere. It was either that or install a second phone line which of course I didn't want to do. So if I didn't go online and get my BBS file first it would be a loooong time before I could. LOL!! I totally forgot about the perils involved with downloading on dial up. If someone picks up the phone in the other room and starts dialing the download would crash. Very frustrating for what was already long download times. The first computer I bought was an Apple IIe, with dual floppies, and the extended memory, for a whopping 128 kilobytes total. The oldest machine I currently have is an Intel Intellec 8, with the 8080 upgrade kit installed. Yes, it boots. I also have some newer (but still old by computer time) NeXT machines and Macs. Wrote my first program in 1967 using the Intercom language on a Bendix G-15 system my college got from government surplus. It had about 500 tubes in it and a drum memory. When the thing arrived we didn't know where to put it. The Science hall was adjacent to the library and both buildings had both men's and women's rest rooms. The chemistry and physics professors decided to gut the women's rest room in the science building and put the computer in there. I was on work study program so was involved in the whole procedure. Once the system was installed we found out that 500 tubes can heat a very big area. We always knew when the system was running because all the windows and doors were open even when the outdooor temp was in the 20s. Yes, I remember being very frustrated with DW a few times!